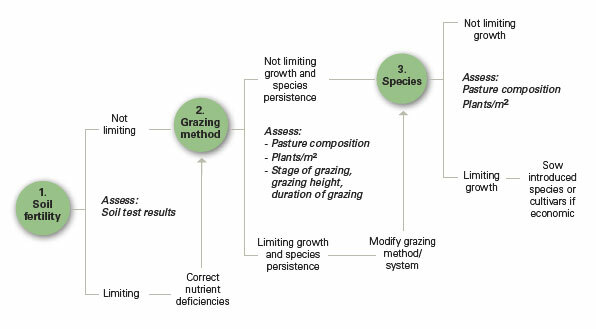 Use the decision tree (below) to help you determine if you can grow more pasture and to prioritise options. Measure your soils and pastures (activities indicated in bold and italics) to identify where you will get the biggest gains in pasture growth. This will then allow you to prioritise where to invest your time and dollars. A decision tree to help you determine if you can grow more pasture and to prioritise options. Measure your soils and pastures (activities indicated in bold text) to identify where you will get the biggest gains in pasture growth. This will then allow you to prioritise where to invest your time and dollars.